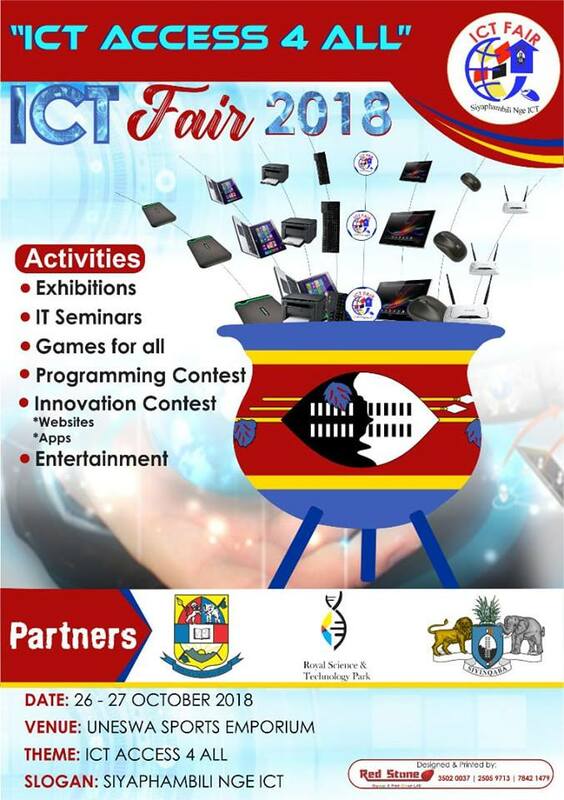 It is that time of the year again where we host our annual ICT Fair. This fair is mainly aimed at raising ICT awareness to all citizens of the kingdom of Eswatini. The fair will be hosted this month on the 26th and 27th. Everyone is invited to attend and there will be activities suitable for all age groups. Some activities include exhibitions, programming contests, gaming contests, innovation contests, seminars, entertainment, etc. To create Information and Communication Technology (ICT) in the Kingdom of ESWATINI to support His Majesty’s Vision 2022. The Kingdom of ESWATINI is undergoing a dynamic transition from a paper economy to a digital economy as technology becomes imperative in digital transformation. It aims to promote ICT companies, organizations and professionals in the country in that it provides a platform for them to come and showcase their services and products, promote technology in schools, colleges, universities, communities and the country at large. Through seminars which are conducted by reputable professionals in the ICT space in the country, topical issues in the country are discussed. Other events that will take place during the fair are games, programming contests, entertainment, etc.